This is the view looking down from the trail at Havasu Creek on the way back to the rafts at the Colorado River. 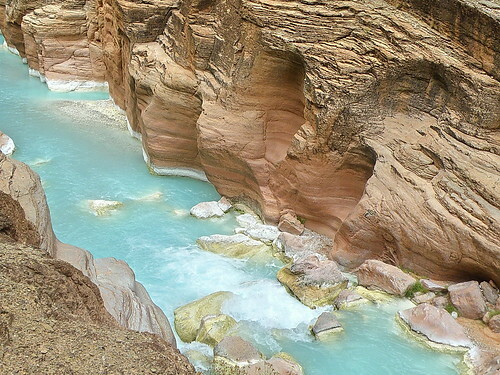 We stopped at Havasu Creek (RM 156.5) and hiked to Upper Beaver Falls and Beaver Falls. We stopped before entering the Havasupai Reservation since they charge a hefty fee. The creek is an amazing shade of aquamarine blue.